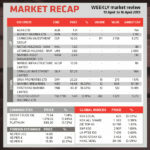 The local market was active this week, with the NSX Local index down 0.02% at 635, and the NSX Overall Index up 0.98% at 1382. 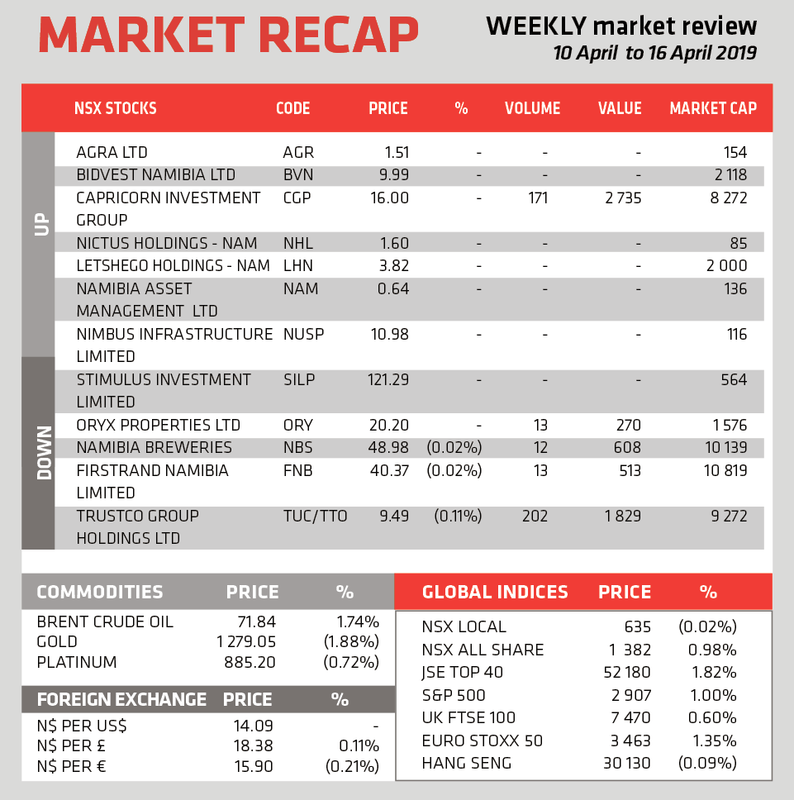 As at 16 April, FirstRand Namibia was the largest local company on the exchange, with market capitalization of N$ 10.8 billion, followed by Namibia Breweries with N$ 10.1 billion, Trustco Group with N$ 9.3 billion, and Capricorn Investment Group with N$ 8.3 billion. In terms of volume Capricorn Investment Group lead the market with N$ 2.7 million worth of shares traded, with Trustco Group in second place with N$ 1.8 million worth of shares traded. The local currency was flat against the US Dollar, to close at N$ 14.09 per USD, and gained 0.11% against the British Pound, to close at N$ 18.38 per GBP. It closed at N$ 15.90 against the Euro, a loss of 0.21%. The Namibia Statistics Agency released the inflation figures for the month of March 2019, and revealed that annual inflation is now 4.5% compared to 3.5% the same time last year, having decreased from the 4.7% recorded for February 2019. Increases in price were noted in the baskets of clothing and footwear (-5.7 to 0.8%), recreation and culture (2.8 to 6.2%), food and beverages (2.7 to 5.8 %), alcoholic beverages and tobacco (4.3 to 6.7 %), Hotels and restaurants (3.7 to 5.3%) Education (9.9 to 11.3%) and Communications (0.4 to 1.0%). The NSA also announced that from next month, Zonal inflation figures would also be released. The zones are Zone 1 covering the following regions: Otjozondjupa, Kunene, Oshana, Omusati, Oshikoto, Ohangwena, Kavango East, Kavango West and Zambezi and with data collected from Otjiwarongo, Katima Mulilo and Oshakati, respectively. Zone 2 covers the Khomas region and data is collected from Windhoek. Zone 3 covers the Omaheke, Hardap, Karas and Erongo regions and data is collected from Gobabis, Mariental, Keetmanshoop and Swakopmund.